As one of the fasting growing and most complete sales and marketing software available on the market today. 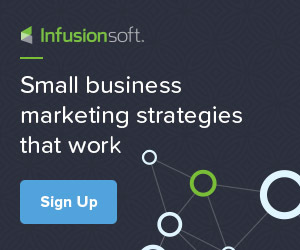 Infusionsoft has combined email marketing, sales, ecommerce, marketing, and CRM to help small business owners attract leads, grow sales and wow their customers around the world. Infusionsoft is very robust and in fact does have a learning curve. As a small business owner responsible for the day-to-day operation of your business time is one thing that should be utilized wisely throughout the day. Therefore, taking the time from doing what you are best at to learn how to use this software is not utilizing your time wisely. I’ve worked with and spoken with many business owners who have purchased the Infusionsoft software either because they were at an event or was told how awesome it was by a colleague or coach. The one thing I can say that I hear very regularly is how much time it takes them to try to figure out how to do the basic setup and management. As an Infusionsoft Certified Partner and Administrative Consultant I provide the experience users of Infusionsoft is looking for. Infusionsoft Admins provide the knowledge to get business owners started with the implementation process they need to get their email campaigns and web forms set up, manage CRM, segment contact lists and more. Infusionsoft Admins provide the support necessary to effectively utilize the Infusionsoft application so that it truly benefits them in growing their business. Campaign Implementation and Testing – Don’t have a free offer on your website to help grow your list? Here’s where you can get started with getting that set up. Not only will you have the form, but you will also set up a series of emails to be sent over a period of time in an automated format. CRM Management – If you’ve not yet transferred your list from your previous list provider. That can be taken care of. Once the list is imported it can then be tagged (segmented) in order to better target those on your mailing list. What this mean is that you can easily separate those who have purchased or attended an event from those who have not. Reports and Analytics – Analyzing your data is a very important part of your marketing efforts. This helps you to see what is and is not working with your emails, etc. The Infusionsoft software includes the reports necessary to quickly review and analyze your delivery/open rate. This makes it so much easier for you to then decide what needs to be tweaked. Email Broadcasts Preparation – Broadcast allows you to send emails without building a campaign. This can be a simple email advising them of an upcoming sale, your newsletter (ezine). Whatever you want to communicate to them about that does not need to be in a nurture sequence. This option also provides an easy way to track your open rates, and find out who clicked on the link(s) in the email sent. Ecommerce Setup – Add products and subscriptions, create order forms for your shopping cart, set up and manage discounts and promotion codes, and more. Referral Partner Setup and Management (Affiliate Partner) – Are you ready to partner with others on your upcoming event or new product? Here is where you can utilize the software to manage every aspect of the referral partner process. From partner registration form to payouts, all in one easy location. Data Cleanup – Now that you’ve imported your list to the Infusionsoft software, there are names on your list that should be eliminated, because of bad data, duplicate names, or just non responsive. Let’s face it, if you have a large list and only a small number of that list buys or engage with you regularly then you need to consider purging that list. Because the software if so robust, it is often very overwhelming once you’ve purchased it. Since you have a business to run, this is the time for you to add someone to your team who understand and have experience with this software. Hiring someone to focus on Infusionsoft while you focus on what you do best is one of the most important thing for business owners new to the software to consider. If you want to find out how an Infusionsoft Admin can help you reap the benefits of this software. Click here to schedule a discovery session today. Also, if you already have the software I would love to hear about your experiences with it in the comment section below. Do You Have Summer Vacation Plans?